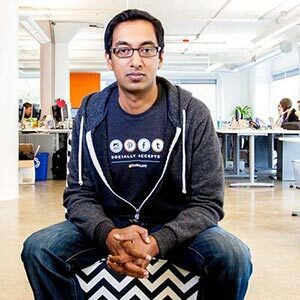 Apu Gupta is the CEO and co-founder of Curalate, the leading marketing platform for the visual web. Curalate enables brands to measure, monitor, and grow a presence on visual social media sites such as Pinterest and Instagram. Curalate is currently in use by over 300 brands, including Neiman Marcus, Michael Kors, Gap, and Better Homes and Gardens. Curalate is backed by top-tier venture capitalists, among them New Enterprise Associates (NEA) and First Round Capital. Prior to Curalate, Gupta worked in retail and technology. Gupta built the second-largest drugstore chain in India as the COO and CMO of MedPlus Health Services. He also served on the interim management team of Peracon, a provider of software for the commercial real estate industry, and was in sales and marketing roles at WebEx Communications, from its Series A financing through its IPO. Gupta has an undergraduate degree from the University of Texas at Austin and an MBA from the Wharton School of Business.